The iPhone 7 not only looks premium but features some great upgrades to make it one of the best smartphones on the market. 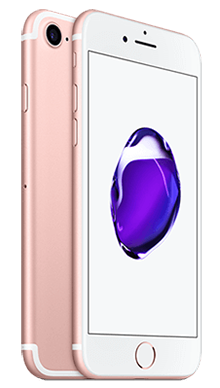 Select your desired options to find the best Apple iPhone 7 deals for you. Apple has dominated the smartphone market for over a decade, releasing a long line of handsets that have never failed to impress with their premium design and innovative technology. For this reason, they now have a loyal following of fans across the globe who are always awaiting the latest announcement from the tech giants. It may seem like only yesterday that the iPhone 7 was released to a crowd of long awaiting Apple fans, and even though it has now been surpassed by newer iPhone models, it is still a fantastic smartphone that is increasingly more affordable. If you’re on the hunt for a new smartphone and have your eye on an iPhone, we at Metrofone would strongly recommend checking out the iPhone 7 before you rush to sign up for a more expensive handset, it has some fantastic features at a great price. 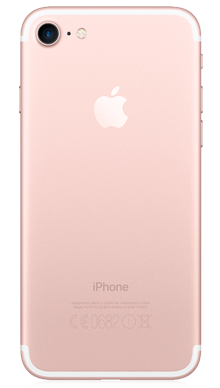 The iPhone 7 looks extremely similar to the previous iPhone model, with elegant corners and soft, curved edges that make it extremely comfortable to use. While some may think that this is laziness on Apple’s part, we think that it's more a case of not messing with a winning design formula; it looks sophisticated and extremely premium. One difference with the 7, is that it comes in a new colour option. You have the usual space grey, silver, gold and rose gold, but there’s also the addition of the glossy jet black. Be wary of fingerprints, however, as the glossy finish seems to mark easily. Other differences with the iPhone 7 include a larger camera lens, a new home button that acts as a fingerprint sensitive touchpad as opposed to a clickable button, plus the addition of water-resistance, something that Apple has needed to add for a long time to keep up with competitors. The biggest change in terms of design on the iPhone 7 is the removal of the headphone jack. This was initially received with extremely mixed reviews when it was announced, but it would appear that Apple was in fact just ahead of the crowds, as many other manufacturers have now followed suit and started to eliminate the headphone jack on their newer handsets. Interestingly the iPhone 7 doesn’t feature full HD specifications when it comes to its display, but it still delivers a fantastic viewing experience. It features the same resolution as previous iPhone models, but don’t let that put you off; it's fantastic for viewing media and overall contrast is much better, due to a screen that is 25% brighter than previous iPhone models. 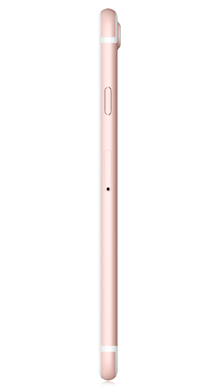 As you might expect, the audio quality on the iPhone 7 is of a very high standard, but there is one significant change that we need to go into; the missing headphone jack. When Apple announced that they were eliminating this fairly standard smartphone feature it hit headlines in the smartphone industry. It means that if you want to listen to music on your iPhone 7 you need to invest in a pair of wireless Bluetooth headphones or a pair of Apple’s very own Airpods. You can listen with a conventional pair of headphones by using the adapter that comes with your new iPhone, but it does mean that you won’t be able to use the charging port, which can be an inconvenience if you’re on long journeys and want to listen to music. With that being said, nowadays you can get hold of a decent pair of Bluetooth headphones for a very reasonable price, and with plenty of other smartphone brands eliminating the headphone jack, we have a feeling that this will soon become the norm. Plus, we have to say that we actually think it's much more convenient to use wireless headphones; there are no annoying cables to get tangled up. The camera on the iPhone 7 is significantly improved compared to older models, it comes equipped with an upgraded six optic lens with optical image stabilisation and a wider aperture than its predecessors. This means that when you take pictures with the iPhone 7 you are getting an increased level of detail and colour saturation, as well as improved performance in poor lighting conditions. The rear camera features a 12MP lens, and with improvements made to the True Tone flash technology, you’ll definitely notice that your shots look much more natural than before. Anyone who has been disappointed with the lack of upgrades to the selfie camera on the iPhone will be happy to note that the iPhone 7 comes with a 7MP front shooter, delivering selfies of a much higher quality than with any other iPhone. The battery has, and probably always will be, a talking point with iPhone users. The battery on the iPhone 7 is much better than the previous 6S, but if you are a smartphone addict who finds themselves constantly using their iPhone, you may find that the battery still starts to drain before the end of the day. The battery life is, however, aided by Apple’s very own A10 Fusion 64-bit system-on-chip, thanks to two low-power cores and two high-power cores, with the phone only ever using two cores at any one time. The performance with Apple’s in-house chips has always been regarded as extremely impressive, and the A10 is no different. It delivers a speedy smartphone experience and is ultra responsive, thanks to the easy to use classic iPhone interface that is also completely customisable to suit your preferences. The handset runs on iOS 10.0 straight out of the box, but it will, of course, easily upgrade to the most recent version so you can be sure you’re getting the most out of your iPhone. 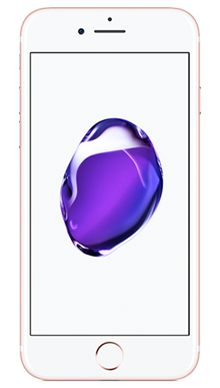 The iPhone 7 is a fantastic choice for anyone on the hunt for a new smartphone; it's perfect if you particularly want an iPhone handset but don’t want to break the bank by forking out for the most recent release. The design is the classic iPhone build that we know and love; sophisticated and premium, with extra robustness thanks to the long-awaited water resistance. The 7 also comes in the new glossy Jet Black finish, giving more choice when choosing your handset. 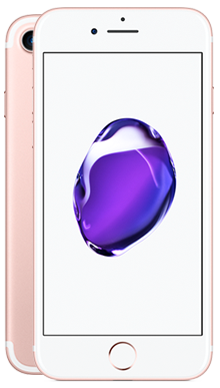 The iPhone 7 features a display that is 25% brighter than previous models, and the viewing experience overall is fantastic, further enhanced by a fantastic audio quality. The removal of the headphone jack may bother some, but it's definitely not a reason not to buy the iPhone 7. The camera on the iPhone 7 is much better than older iPhones, with a 12MP setup on the rear and a seriously improved 7MP shooter on the front. The A10 chip delivers a fantastic smartphone experience that won’t disappoint; anyone who is familiar with iPhones will recognise the classic, and easy to use interface that is smooth and quick to use. At Metrofone we’re constantly on the hunt for the very best iPhone 7 deals. WE’ve been providing the UK with fantastic mobile phone offers for years, and we always want to make sure you’re getting the very best pay monthly contract to suit your needs. EE is one of the UK's leading mobile communications providers, so you can be sure that when you sign up to an EE iPhone 7 pay monthly contract, you’ll get amazing service and great connections wherever you are. If you’d like to know more about the iPhone 7, or if you’d like to discuss a specific deal more closely, then be sure to call one of our great customer service team today, on 0333 900 1144.